Very busy week for Urbana's Market at the Square once again (I think they're all going to be this way), so brevity is in order. How about we start with Market Menu? OK.
Oh! And the City of Urbana has a new website, which means the Market does, too. Much more content will be added as time allows. Please add it to your bookmarks! As for the Market: plenty of fresh produce this week - asparagus is about done (I know, already??? ), but the strawberry thing is MEGA this season. If you're wondering what the heck to do with all the strawberries you just bought, Mark Bittman of the NYT has a few ideas. There'll also be plenty of green things - salad fixings, green onions, fresh cut herbs (including cilantro, parsley, and other culinary herbs), kohlrabi, kales, chards, etc. Look for some greenhouse produce, too - cucumbers, zucchini, and hydroponic tomatoes will all be available at the Market this weekend. Basically, there's a lot that could figure into your holiday weekend eating, if you count all the farm-raised meats for the grill, the baked goods, etc. YUM! Mustn't forget to mention that this weekend, which is looking sold out to vendors as of this writing, will also showcase the handmade work of many artisans, including Jerry Rhoads Woodturning, Cousins Dog Biscuit Company, Manrique Photography, Juniper Moon, South Prairie Street Farm, and many others. Look for updated links in the sidebar coming soon. Finally - the first Art at the Square event of the season is happening this Saturday at the Market. Look for the Urbana Public Arts Program's tent adjacent to the City tent - this year's theme is "Art & the Environment", and Saturday's project will be a collaborative collage, creating a prairie landscape and wildlife scene using materials such as crepe paper, oil pastels, watercolor, and other media. The workshop is continuous from 8 AM - noon, and is free and open to the public. See you there - and thanks for your continued support of your local farmers markets. Supporting the local producers strengthens our local food system, which is becoming more and more crucial of a component to future sustainability in communities. THANK YOU. Sprouts at the Market this weekend - 9-11 AM, free, no registration required, open to all kids ages 3-8. Sprouts has its own blog - check there for details! Lots of produce and plants this weekend - now is the time to get tomatoes into the ground if you're planning on growing some this season, and the Market has several vendors who can help you out. Strawberries and asparagus still reign supreme, but there are a lot of salad greens, kales, chards, green onions, radishes, and other vegetables to balance things out. Fresh herbs, too. Baked goods and prepared foods will abound as well, including the first appearance this year of the Moo Mobile from the Sidney Dairy Barn. Arts and crafts will also be heavily represented this weekend - textiles, woodwork, jewelry, candles, photography, leatherwork, glass, and other handcrafted items will be for sale. We're still working out the kinks in the credit/debit/LINK tokens service - we ran out of credit/debit tokens last weekend! We'll be better prepared this weekend - thanks for your patience. Just a reminder - cash and checks are still welcome by all vendors, and some do take credit cards on their own. if you have any questions about how the credit/debit/LINK service works, please come visit us at the City tent out at the Market, or call 384-2319. Finally, the weather forecast looks pretty darn awesome. Hope to see you there! First Sprouts event is next week, y'all. I love summer. Bring your favorite Sprout age 3-8 to the Market on Saturday, May 22, for a seed-planting workshop facilitated by Champaign County Extension's Master Gardeners and Market grower Tiny Greens. Kids will get a chance to get their hands dirty and learn about how their food gets started during this workshop - the Master Gardeners will provide instruction and simple handouts, while Tiny Greens and Urbana's Market at the Square will supply the materials for the planting. The workshop is free of charge, open to kids ages 3-8, and will run continuously from 9 AM to 11 AM. Each Sprout will receive a certificate of participation and will take a future seedling home, with instructions for its care and planting. Special bonus: All kids showing a certificate of participation at Art Mart Toys get 15% off any purchase in the toy store! Offer good only on 5/22 and only until 2 PM. Thanks, Art Mart Toys! So busy prepping for this weekend's Market (something about a great weather forecast just makes me go crazy with the busy.. or busy with the crazy... I don't know...) that this entry will have to be short. This week's produce will include a bunch more strawberries than in the previous two weeks - just follow your nose into the Market. By my calculations, there will be berries in the first four rows, and Veggie Trails and Tiny Greens (among many fabulous others) are in Row 5, so make sure you give the whole place the once-over to make sure you're not missing anything. Other yummy food in season includes lettuce mixes and head lettuces, spinach, radishes, rainbow chard, fresh cut herbs, green onions, asparagus (still going incredibly strong), celery, etc. There will be many vegetable and herb starts, plus flowers (hanging baskets and bouquets). The farm-raised meats, cheeses, eggs, and honey are all widely available - grassfed, grain fed, pastured poultry and pork, whatever - TALK TO YOUR GROWER. They can give you the straight dope on how what they do is done. LINK/credit/debit cards as payment is totally happening at the Market this weekend and every weekend. See last week's entry for more info about how it works. We'll also have a brochure at the City tent that describes how it works with LINK, and your friendly Market staffer will be happy to answer any and all questions you may have. Thanks for your early support of this program - it's great to have options! Next week - Sprouts at the Market returns with a seed starting workshop co-sponsored by Market vendor Tiny Greens and Champaign County Extension's Master Gardeners. more info next week, or you can check the blog or Facebook page. Gotta bounce - see you Saturday! I don't know about this passage of time thing. All of a sudden it's Friday and the Market is tomorrow and blog has been neglected for the week. This week's entry is important, if only to tell you about how our new EBT (Electronic Benefits Transfer) and credit/debit system will work at the Market. Many thanks to Jason Liggett of Urbana Public Television (UPTV) for taking the time to film and edit these pieces each week. - Ever run out of cash at the Market and didn't feel like hiking to the nearest cash machine? - Ever wanted to use your LINK card and were disappointed to find out you couldn't use it to buy fresh produce at the Market? - Ever find a work of art or a bunch of produce you wanted to purchase using your credit card, only to find out you couldn't? Patrons wanting to use their credit/debit/LINK cards stop by the City tent at the NW corner of the Market to get their card swiped through our brand new wireless terminal. City staff swipes your card through said terminal. PIN is entered, if necessary, and then the desired dollar amount is entered. Credit and debit purchases will carry a $1.00 convenience charge added on to your requested amount, but LINK purchases will never carry a fee. 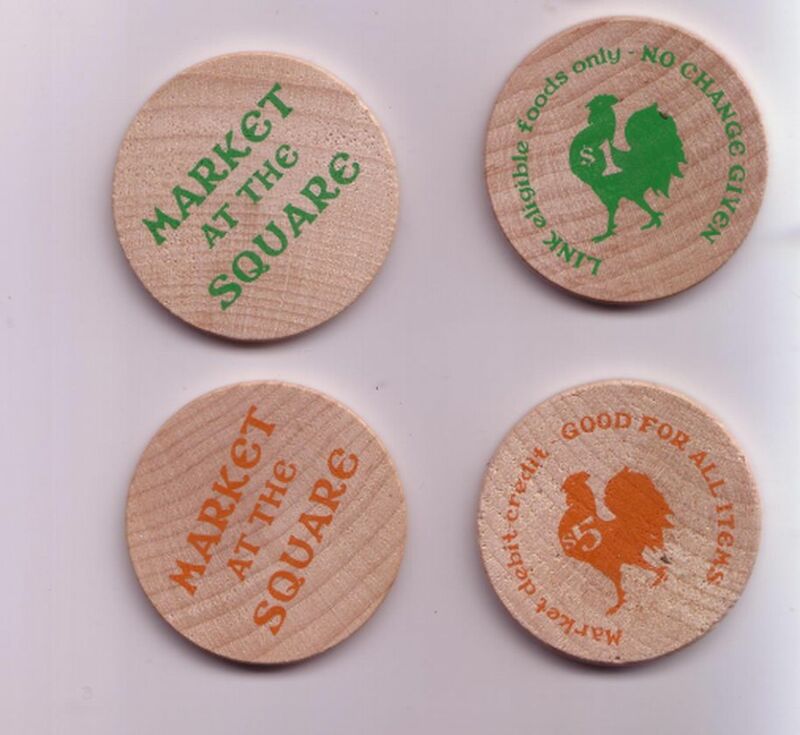 After your transaction is approved, City staff will disburse the amount you requested not in cash, but in cool wooden tokens. Tokens printed in orange are for credit/debit purchases at any vendor in the Market; the LINK tokens - printed in green - are good for LINK-eligible foods by the vendors who sell those foods. There'll be signs at each vendor booth - look for them. If you have questions or want to try it out, stop by the City tent while you're at the Market and we can show you how it works. Be gentle on us as we get this system going - the technology is new to us! Despite our nervousness about the technology, the Cityand Market staff are VERY EXCITED to be able to provide this service to patrons - and to vendors. This week: Asparagus, strawberries (you heard me), lettuces, spinach, mixed greens, green onions, radishes, rapini, rhubarb, and other early-season produce, plus meats, cheeses, eggs, honey, and a metric ton of vegetable, herb, and other plant starts, as is usually the case around Mother's Day. available at the Market. Banners, TV, and radio ads will all be extolling the virtues of Eating Here - buying Illinois-grown fruits and vegetables from the people who grow them. It's good for you, it's good for them, it keep money in our local area and promotes good community vibes. Stay tuned.May 22: Looks like Champaign County Extension's Master Gardeners, along with Market vendor Tiny Greens, will be partnering with the Market for the first Sprouts at the Market event of the season. More info in next week's entry!